Loy Hetrick started playing trombone at age 10 in Fremont, Neb., where he was a student of Robert Olsen. After graduating from high school, he attended the University of Nebraska, where he studied with Vernon Forbes. He was a charter member of the Plymouth Brass, a resident church ensemble, playing with them from 1977 through 1979. Assistant Instructor and later taught low brass at Purdue and Butler Universities. 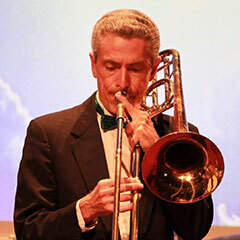 After finishing a Master of Music in trombone performance, they moved to Indianapolis, where he has worked as a freelance musician. He has toured the U.S. and Canada with performers including Andy Williams, Mel Torme, Johnny Mathis, Barry Manilow, and Natalie Cole. Currently, Loy performs regularly with the Indianapolis Symphony, the Lafayette Symphony Orchestra, and the Indianapolis Chamber Orchestra. He has recorded for Sandy Patti, the Gaither Vocal Group, as well as for various music publishing companies. Other jobs include pit orchestra work for the Broadway musicals that come to the Indianapolis area, and the local ballet and opera companies. He has taught private lessons for over thirty-five years.